Midwifery Care has been the standard model of pregnancy, labor and birthing support for women around the world, for thousands and thousands of years. This multi-millennial legacy has contributed a vast collective of wisdom and knowledge about women’s bodies and what works best for mothers and babies as they work together during labor. Even so, the modern era places a significant amount of importance on empirical, clinical scientific evidence. And so, in order to answer the deeper questions about pregnancy health, natural births – both at a birthing center or at home – water birth safety, the importance of breastfeeding and other topics, we have assembled our Bakersfield Birth Center Evidence Page. The information you find here, as well as links to other sources, can provide you, your family and friends with a wealth of facts and statistics that support your decision to birth as naturally, in the location of your choosing and with as much experienced and compassionate labor support as is possible. Prenatal Care Matters: For midwives, and now the medical community at large, prenatal care begins long before you ever conceive your baby. The healthier your body and reproductive organs are, the more likely you are to have a healthy pregnancy and birth experience. When you are ready to conceive, your midwife can help you adjust your diet and lifestyle, often with the addition of FDA-approved supplements and herbs, in order to facilitate conception and a healthy uterine habitat. Once you are pregnant, Justine will provide unconditional support, and monitor the changes occurring for you and baby. She will also provide information about foods and supplements that provide the best nourishment for you and baby, teas that support uterine and breast feeding health, and Justine’s compassion, empathy and wisdom will also support your mental and emotional well-being. Contact Bakersfield Birth Center to schedule a consultation and to schedule your well-woman or prenatal care visits. Natural Birth: Women have been giving birth naturally for centuries– this rich legacy has lead to an incredible system in which the mother and baby perform a biological dance; giving and receiving essential hormones that help both mother and baby prepare for birth, and extrauterine life. These labor-specific hormones facilitate a rush of euphoric feelings, and indescribable mother-baby bonding. Our bodies are designed for natural birth and breastfeeding. The minute you introduce synthetic chemicals – Pitocin to induce labor, epidurals, pain medications, anesthesia for unnecessary Cesarean sections, etc., this natural, system begins to move out of sync – and the results can be negative for both mother and baby. These consequences range from complications that lead to unnecessary C-sections for mothers and or mother-baby dyads who find breastfeeding a much greater challenge than it should have been. You can visit the MANA.org Research Page to read a host of studies that conclude natural, physiologic birth is always best unless women and/or their fetuses develop complications that warrant medical attention. Have questions about the natural birth process? Please contact the Bakersfield Birth Center or contact us online. Laboring at a Birth Center: So what’s the difference between a freestanding birth center and a labor and delivery wing at the hospital? Well, in most areas around the nation, the difference is profound. There is no escaping the protocol driven, one size fits all model of treatment found in a hospital.The lack of flexibility, and limited support resources in the hospital makes it difficult to labor without medication. The only tool the hospital staff has for supporting women in labor is drugs. In addition to this many women find hospitals stressful environments, which can put their bodies in a state of distress, resulting in a “fight or flight” response that makes it more difficult (or impossible) to enjoy a safe, natural, mother-baby led labor and birth journey. centers with Certified Professional Midwives match those associated with low-risk hospital births. Please call to schedule a consultation,to tour our center, and to speak with Justine Backhaus,Certified Professional Midwife and owner of the BBC. Laboring at Home: For a healthy, low-risk mother, a planned home birth with a Certified Professional Midwife is one of the safest and most comfortable ways to experience labor and the birth of your baby. You can move when you want to move, eat and drink when you want to, and you have complete control over who and what surrounds you as you labor. In other words, a planned home birth with a Certified Professional Midwife is one of your safest and best bets if you want to experience a safe, natural birth – free of medical interventions. Even in situations (about 12%) where a woman opts for or requires transport to a hospital, rates of epidurals, episiotomies, forceps or vacuum extractions are all less than those associated with planned low-risk hospital births, while infant and maternal mortality rates remain the same. 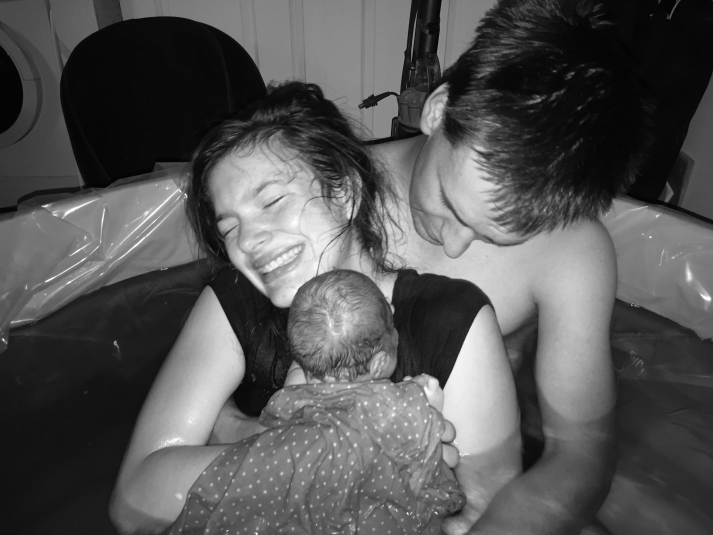 Water Births: Whether you choose to have your baby in a birthing center or at home, one of your first queries is probably: To Water Birth or Not to Water Birth – is it safe? And, will I want to? The answer to the first questions is, yes – water births and brief post-birth infant immersion is completely safe for both mother and baby. The American Association of Birth Centers has systematically reviewed the data from thousands of cases, determining that the, “…data demonstrate that water birth, with careful selection criteria and experienced providers, does not negatively affect mothers or newborns.” To follow that up, they determined that when the birth is attended by a certified provider, there are also low- to zero incidences of transports, newborn complications, or newborn respiratory issues. As for whether or not you will want to, there is plenty of evidence that shows women who labor in water have a more comfortable labor and delivery experience, and that water births allow women to move more freely during and in between contractions. We can put you in touch with hundreds of our clients who have opted to labor in and/or out of the water so you can her personal opinions on both. We say, “when in doubt, have the tub ready.” At the end of the day, you never really know what you will or won’t want during labor; only you and your baby will know that when the time comes. It’s much better to prepare for a water birth and not need it, than wish you could get into a tub that isn’t there. Read the AABC’s Position Statement: Immersion in Water during Labor and Birth for more detailed information regarding their review, findings and official conclusion. Justine and the staff at the Bakersfield Birth Center are always available to answer questions or provide further information as well.